Cr-Mo-V-W high-entropy alloy (HEA) is studied, with 2553 K equilibrium solidus and high Cr content to promote protective oxide scale formation, suggesting potential applications in hot, oxidising environments. 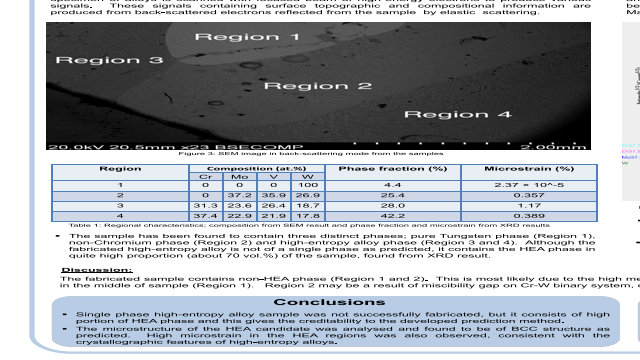 Alloy Search and Predict (ASAP) and phase diagram calculations found a single phase, body-centred cubic (BCC) solid solution at elevated temperatures, across the range of compositions present within the system - uncommon for a HEA of refractory and transition metals. Density functional theory identified solubility of 22 at.% Cr at solidus temperature, with composition-dependent drive for segregation during cooling. An as-cast, BCC single-phase with the composition 31.3Cr-23.6Mo-26.4 V-18.7 W exhibiting dendritic microsegregation was verified.